Join us for a screening of six short films with outsize impact — all in Spanish, by Mexican filmmakers, and part of The Times’s Op-Docs series of documentaries. The program, moderated by Times reporter Eduardo Porter, includes a discussion with the films’ creators, who are flying in from Mexico for this event. The films to be screened: “Ciudad herida”/“Ruptured City” by Santiago Arau Pontones and Diego Rabasa, chronicling the 2017 central Mexico earthquake; “Niños en la narcozona”/“Children of the Narco Zone” by Everardo González, following a school teacher and a former gang member; “Un prisionero en la familia”/“A Prisoner in the Family” by Indra Villaseñor Amador, about a woman desperate enough to lock up her own child; “El buzo”/“The Diver” by Esteban Arrangoiz, portraying Mexico’s happiest sewer denizen; “La palabra justa”/“Justice in Translation” by Sergio Blanco, on the language gap in the Mexican justice system for indigenous people accused of a crime; and “Unsilenced” by Betzabé García, on an activist murdered on-air while hosting his radio show. All Access Plus and Home Delivery subscribers save $6 per ticket. Become an All Access Plus subscriber to The New York Times to save on this event and receive special access to our live and digital programs, along with discounts and bonus subscriptions. Grocery mecca Trader Joe’s has been posting signs in its Manhattan stores to let shoppers know it will end delivery service as of March 1, the New York Post reports. The quirky discount chain store known for its unique grocery items and clever crowd-control strategies cites escalating service costs as the reason for what a West Side Rag reader called an “unspeakable tragedy.” To be fair, the California-based chain is known for encouraging thrifty shoppers to buy in bulk, making the need for schlepping assistance a real concern. Trader Joe’s has been delivering groceries to Manhattanites for 10 years. Delivery was never offered in Brooklyn, Queens or Staten Island stores. Live From Lincoln Center is proud to present Lincoln Center Theater’s critically acclaimed staging of Dominique Morisseau's Pipeline, available for broadcast on PBS February 8 and streaming on BroadwayHD. Congestion pricing is dead in the water again. But New York City's traffic and subway problems continue to get worse while the population and Cuomo and De Blasio's battles continue to grow. Something has to give. With that in mind, the question remains, if congestion pricing ever happens, what is the relationship between congestion pricing and NYC real estate? Friday’s release of the governor’s budget makes it clear that Cuomo has decided its time had not come. Since the 1970s, New Yorkers have heard talk of implementing congestion pricing rise and fall. Despite seeming like it had a real chance this time around, it has been shelved again. 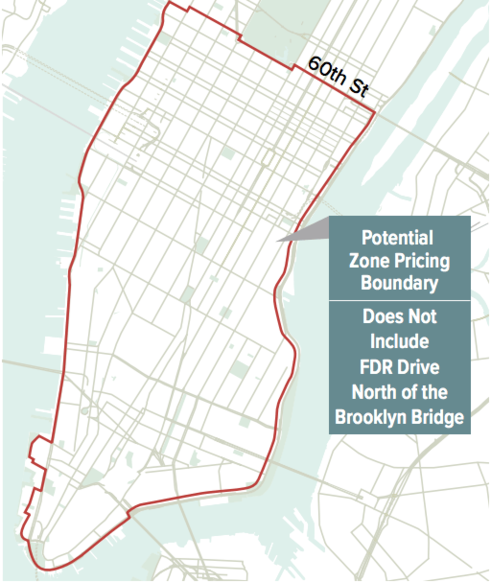 Perhaps this is just a thought experiment with the most recent quashing of the congestion plan but assuming congestion pricing does happen someday, what would it mean for New York City real estate? Other major world cities have implemented congestion pricing, therefore, we have some idea what it has meant for other cities. But, as always the case, New York City is a beast of its own, so there are some trends it would most likely follow and others for which it would forge a new path. Cuomo’s Fix NYC panel’s report addressed the city’s traffic congestion problems. The panel’s first recommendation tasked the MTA to fix the public transportation issues in order to provide reliable alternatives to setting dynamic tolls for driving below 60th street. The highlights of Fix NYC’s recommendations were: an $11.52 toll on all private cars entering the central business district (defined as Manhattan below 60th Street), $25 for trucks and a surcharge of $2 to $5 for for-hire vehicles which would result in $1.8 billion a year toward public transportation. They estimated this would lead to a 20% increase in traffic speeds and a huge reduction in the amount of time New Yorkers would spend getting to their destinations. According to the study Necessity or Choice: Why People Drive into Manhattan, Manhattan's Central Business District (CBD), "is the largest and densest CBD in the United States. It is far better served by public transportation than any other location in the country.” On a daily basis, 830,000 vehicles enter the CBD, of which approximately 60% of vehicle traffic were personal cars. That means only 40% were trucks, buses, commercial vehicles or taxis. The most significant finding of that study was 90% of people driving in Manhattan choose to drive even though they have public transportation options available to them. Another big part of our traffic problem is that almost 40% of cars traveling into the CBD are only using NYC as a conduit to get somewhere else. Amazingly, many car commuters find the routes across Manhattan faster and cheaper than alternate routes. And a final big issue is the rampant abuse of parking placards. While Bloomberg tried to cut down on parking placards, Bill De Blasio has issued more, adding to the increase of traffic and lack of parking. According to a New York Times article on the abuse of placards, “city-issued parking placards entitle the bearers to park in designated zones. The city says that there are about 160,500 total in circulation.” Placards entitle owners to free parking in specially designated spots. The demand for placards is so high there is even a black market for them. Adding tolls to drive into the CBD would definitely make people think twice about driving in for free parking. Therefore, congestion pricing would not only reduce traffic and environmental issues, it would also cut down on parking placard abuses and take New York out of the running as one of the worst traffic cities in the world. At this point, our politicians are not willing to take the risk but Singapore, London, Stockholm, and Madrid have. All of those cities have seen huge reductions in traffic due to the added congestion tolls. The report says Singapore saw a 24% reduction and London had a 25% reduction with a 20% drop in carbon dioxide emissions. Despite the fact that Stockholm’s efforts were met with huge opposition, they saw immediate improvements with a 25% drop in traffic. Milan’s “Ecopass,” program charged vehicles based on their emissions class, banned the worst polluting vehicles and has also seen great success. So what does congestion pricing mean for real estate? Amy McDonald, a broker with Triplemint, says she lives on a large boulevard and would love to see and hear less traffic out her window. “I face 6th Avenue, which is a major uptown route, and I would love to have less cars.” Most of McDonald’s clients live on the Upper West Side and own cars but she does not see a CBD toll as an issue for them on a daily basis as they tend to use their cars to get out of the city and therefore would not cross through the CBD. If and when congestion pricing ever moves beyond politician's banter, Chin thinks the most important issue is educating consumers about what is going on in the city. Charging a toll to drive into certain parts of the city will directly affect the value of buildings in and around the CBD. Consumers should be mindful of that. An additional consideration is weighing the benefits of the toll proceeds that would funnel into the MTA to improve the public transportation against the disproportional affect congestion pricing has on the upper and lower income population from the start. Unlike some other taxes, every car is charged the same, no matter the income level of the driver. This is no doubt a complicated issue but with the city’s population increasing every day and new buildings rising at a rapid rate, something has to be done. Considering the possibilities when making a longterm investment, like housing, might make you want to take an alternate route. Drivers entering the busiest areas of Manhattan might soon be required to pay $11.52 per trip under a congestion pricing plan expected to be released by Gov. Andrew Cuomo on Friday. According to the New York Times, the proposal comes from an advisory panel “Fix NYC,” a group assembled by the governor to explore ways to reduce congestion and also fund the city’s strapped-for-cash transit system. Under the proposal, trucks would pay $25.34 and taxis would see a surcharge of $2 to $5 per ride if entering the “pricing zone,” which would run south of 60th Street. Cuomo first introduced the idea of a congestion pricing plan to fund the MTA‘s transit repairs in August, after declaring the subway in a state of emergency earlier that summer. Cuomo said the plan will not extend to the East River Bridges. However, it will not reduce the cost of tolls at other crossings as some transit groups pushed for as a way to make the plan more equitable and more likely for lawmakers outside of the borough to support it. The congestion fee would also not be in effect 24 hours a day, with tolling on private cars expected to occur at a minimum between 6 a.m. and 8 p.m. On the weekend, there might be a charge between 12 p.m. and 10 p.m. for private vehicles and trucks. Cuomo’s plan is roughly based on Mayor Michael Bloomberg’s failed attempt in 2008. The former mayor’s idea served as a major part of his environmental agenda, which he claimed would have raised $500 million annually to fix the subway’s infrastructure. The plan failed because elected officials from Brooklyn, Queens and suburban areas outside of the city felt it benefited Manhattan at the expense of their own constituents. Mayor Bill de Blasio has criticized the Cuomo’s idea and called it a “regressive tax.” Instead, he has floated the idea of a “millionaires tax” to fund subway repairs, increasing the tax rate of the city’s wealthiest residents to 4.4 percent from roughly 3.9 percent for married couples with incomes over $1 million and for individuals who make more than $500,000 per year. 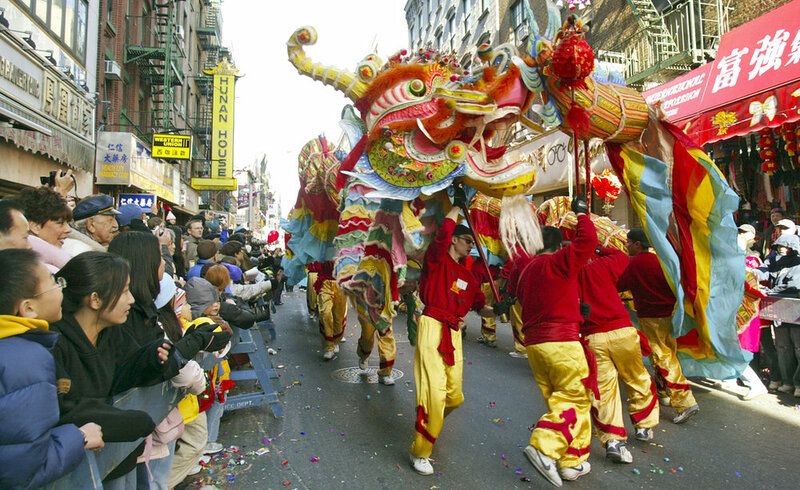 A Chinatown landmark, the 1887-built Eldridge Street Synagogue, is participating in the neighborhood celebration with a day of Lunar New Year crafts. The team at Think!Chinatownwill lead a free lantern decorating class, teaching participants how to stencil designs using paint and ink, stamps, or brushwork. The beautifully-designed lanterns will be on display in the bamboo garden at 5 Essex Street. 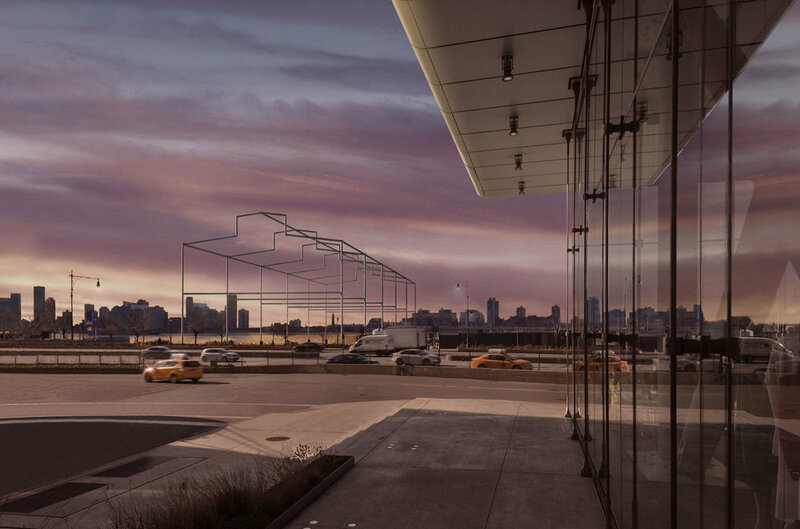 The Hudson River Park Trust has unanimously approved a proposal by James Corner Field Operations—the same firm that brought us the High Line and Brooklyn’s Domino Park—to design a 5.5-acre public park on the Gansevoort Peninsula, located at the western end of Little West 12th Street and the only remnant of 13th Avenue. It will be the largest single green space in the four-mile-long Hudson River Park. The design will incorporate recreational areas and provide direct waterfront access for the public with a beachfront on the southern edge that will double as a protective barrier to combat flooding and storm surge. The beach might be best for sunbathers, though, as swimming in Manhattan’s murky west side waters is unlikely to be viable. Hudson River Park Trust and James Corner Field Operations will begin soliciting feeback from the community and local elected officials before signing off on a final design. Construction is expected to begin in 2020, with the park opening slated for 2022. The announcement comes soon after Governor Cuomo’s State of the State speech on January 19th, which included a $23 million pledge for the completion of Hudson River Park. The city is expected to match the state’s contribution, a request that the mayor’s office said it would consider. The park has $900 million worth of capital projects underway, including privately-funded initiatives like Barry Diller’s Pier 55 and a commercial pier to be developed by RXR Realty and Youngwoo & Associates at Pier 57 which will include more than three acres of public open space, including a rooftop park and perimeter esplanade. Ms. Spannan at Storm King Art Center. Sandra Spannan is an architectural fine artist, gilder and art restorer; she bundles those occupations together at See. Painting, the company she founded after moving to New York from Germany in 1993. Ms. Spannan, 47, has done private interiors for Anderson Cooper and Tom Hanks and gilding work for Balthazar and the Ace Hotel. Most of the week Ms. Spannan lives in Harlem with her daughters, Fiona Jarvis, 14, and Kaya Jarvis, 12, and their cat, Panda. On weekends, while the weather is good, she piles the girls, their friends and Panda into an army-green Jeep and heads to her house in Monroe, N.Y. She bought the house, named “the green house” for its paint job, in 2015, a year after she was diagnosed with the colon cancer for which she is still being treated. “The only negative thing about buying that house is that I didn’t do it 20 years ago,” she said. “The only negative thing about buying that house is that I didn’t do it 20 years ago,” Ms. Spannan said of her weekend home in Monroe, N.Y. COZY I try to be that person you read about in Sunday Routines who goes running or does yoga first thing, but I’m really not. I love to be in my PJs forever. I’ll get the paper and get back in bed with my English breakfast tea. The kids are teenagers now so they can sleep like newborns. I let them. “I’ll hear the girls at 8 in the morning, bouncing. Trampolines are quite ugly but we love it. LET’S BOUNCE We don’t have the luxury of having a balcony or a garden in New York, so it’s nice to walk outside in the morning. I bought a 16-foot-wide trampoline. I’ll hear the girls at 8 in the morning, bouncing. Trampolines are quite ugly but we love it. If we have a party the kids will lay on it in a circle listening to music. Ms. Spannan, right, and her daughter, Kaya Jarvis, at Blooming Hill Farm. PIXELATED REUNION My family is in Germany and my brother is in Japan so we try to Skype as a group. I have three siblings and my parents have several grandchildren so there’s always some family drama going on, somebody who needs to talk. I try to do that before the kids are awake. ALL-ORGANIC One thing we always do when we’re in the green house — it’s basically a must when we’re up there — is we go to Blooming Hill Farm, which is nearby, for brunch. It’s not in a hipster neighborhood, it’s in an area where there’s straightforward diners and stuff. They have this all-organic brunch there, and I also do all my vegetable shopping at their farmer’s market. On the menu they have breakfast pizza. They also have sweet stuff like French toast-style bread pudding for the kids. Eating organic is important to me because I’m fighting cancer. I try to eat mostly fruits and vegetables. LET’S DANCE After brunch I try to force my kids to do a little hiking trip with me. What they love to do is to go to Dia:Beacon, the museum, or to Storm King Art Center. Both kids are modern dancers. They’re both in a group called Young Dance Collective that does pretty professional shows. So if we go to Storm King they’ll do these time-lapse kind of videos where they’re dancing with the sculptures. Basically I trick them into hiking. Just a couple of New Yorkers getting their grass time in. PROJECTS AND TEA Sometimes we do an art project, like buy pumpkins and gold leaf them. Or we might do yard sales. The kids are both into second-hand clothing. I also do a lot of leaf-raking this time of year, or a house project. The house is from the 1930s so there’s always a project. In fall we have the wood-burning stove going at all times and there’s always a water kettle on it, so hot water is always ready for a cup of tea. From left: Fiona, Kaya and Ms. Spannan at Black Forest Mill in Highland Mills, N.Y.
CULINARY ROOTS I just discovered a German restaurant 10 minutes from my house, the Black Forest Mill. We’ll go there for dinner and it brings me back to my roots. A lot of the time in New York you don’t get the real deal. This is the real deal. They have käsespätzle, which is a cheese spaetzle. And for dessert there’s a chocolate tort called schwartzwälder kirschtorte. GET YOUR MOTOR RUNNING If the kids are doing homework or something I love going on a sunset ride on the bike. It’s an old-timer, a Honda CB77 Super Hawk from 1964. One interesting thing about that bike is it’s the same as the one from “Zen and the Art of Motorcycle Maintenance.” The fall is the best time to ride because it’s not so hot and bikes don’t overheat. HEAD OUT ON THE HIGHWAY Usually we load the car and head back to the city after dinner. First we have to collect the cat. When he gets upstate, he sets out for hours and sometimes we can’t find him. He has friends up there. An all volunteer organization founded in 1981. Our mission and purpose is to be a catalyst for the rehabilitation and maintenance of Morningside Park in accordance with the ideals of its original designers Frederick Law Olmsted and Calvert Vaux and its well deserved status as a Scenic Landmark of New York City. We work with the New York City Dept. of Parks to promote responsible use of the park. In 2000 we commissioned a Master Plan for Morningside Park which was based on extensive community input. We continue to work to raise private funds and advocate for public funds to implement capital improvements called for in the plan. We promote the enjoyment and responsible use of the park through an extensive set of programs which over the years have included arts and cultural festivals, a farmers market, film screenings, public art displays, musical and theatrical performances, sports tournaments, community picnics, park cleanups and plantings, tree lightings and holiday events. In 1981 Tom Kiel a Columbia University undergraduate saw the deteriorating condition of our historic park. He began organizing meetings and park cleanups. At the time, the Parks Dept. was getting ready to implement large scale changes to the park which would have obliterated much of the remaining Olmsted design. Along with several other Columbia students, Tom formed the Friends of Morningside Park with an aim to halt these changes and fight for park restoration in keeping with Olmsted's design priniciples. Incorporated in 1982, the core mission of the Friends of Morningside Park has not changed to this day. Although the world lost Tom Kiel in 1996, his work continues and we are proud and very fortunate to have members of his family, members of our original board, and volunteers from our early years still working with us. We maintain an archive of articles about Tom and the early work of our organization. We are thrilled that the Parks Dept. has listened to our desire that an RFP (Request for Proposals) be reissued for a cafe at the overlook at 112th and Manhattan Ave. We think this is a great opportunity for the right concessionaire and hope the RFP will generate lots of interest from the Harlem business community. The RFP is available for download through February 22, 2019, on Parks' website. You may also download the RFP from our server. We are providing this download to facilitate dissemination of the document only. All questions related to the RFP should be directed to the Park project manager listed on page 2 of the document. If you are going to submit a bid you should also register with Parks to be kept up-to-date on any changes or announcements related to the project by visitinghttp://www.nyc.gov/parks/businessopportunitiesand clicking on the "Concessions Opportunities at Parks” link. 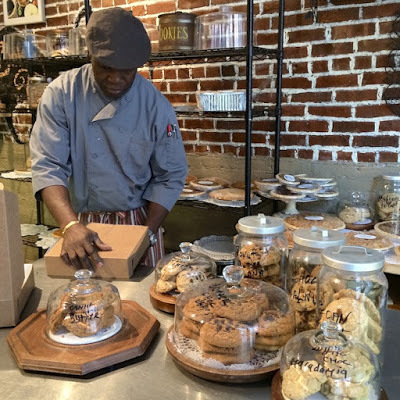 Chef Southern Southern Style Bakery at 122 Hamilton Place between 143rd and 144th is one of the oldest artisan businesses in Harlem and makes a great addition for any holiday feast. Chocolate Pecan, Sweet Bean Pie, Pumpkin Pie, Key Lime Pie, Three Berry Crunch Pie and many more including Harlem's best Sweet Potato Pie can be purchased at the storefront or made to order for pickup. There is an industrial baking kitchen at the back of the charming storefront so everything is made on site and the Sweet Chef even packs it up for customers out front. Call 914-258-4418 for a pickup order or more details. 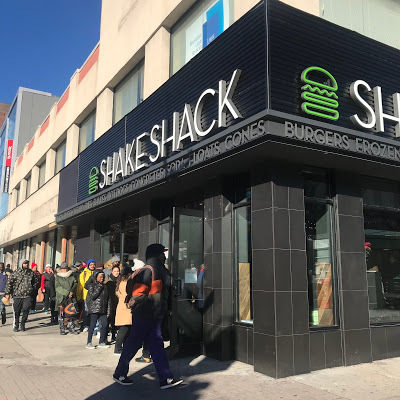 Locals were lining up just before 11:00AM today to be the first ones to check out the menu at the new Shake Shack on 125th Street by Fifth Avenue. 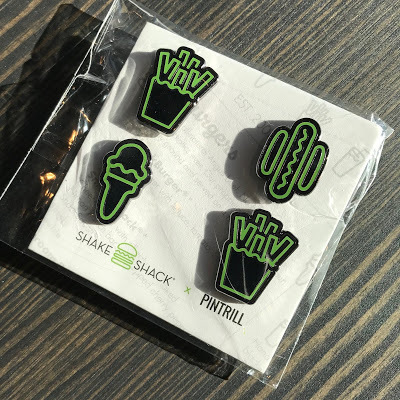 An uptown location by 116th Street in Morningside Heights hadopened last year which was the furthest uptown Shake Shack had ventured until now. For the Central Harlem debut, a gospel choir sang in the background as diners streamed in to try out one of the most famous burgers in New York which was started up by fine dining restauranteur Danny Meyers who actually dropped by for the festivities. 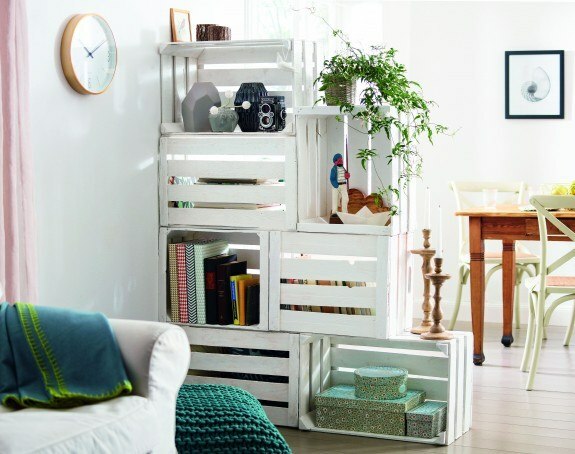 The conveniently cubic Kallax shelves are a common go-to for many folks thanks to the added bonus of extra storage space, but wood crates can provide the same effect for much less. Using shelving for dividers also gives partners more opportunity to express their individuality in a space. Foldable partitions, on the other hand, are easy to stow when guests are over. If you have the opportunity to start anew together, search for an apartment building with common space, or seek out a neighborhood that’s well served by cafes or other spots that can be used year round. Inclement weather and unexpected fallouts will make a small apartment feel even more strained and claustrophobic. If closet space is scarce, add hooks to the interior of closet doors or on the sides of dressers where you can fit them. If you’ve got great stuff you can show off, hang your belongings gallery wall-style using strategically placed hooks. Look up for storage solutions. Space above cabinets can easily be used to stow books, pots, pans, or anything you don’t use regularly. The area above your bathroom door is also an oft forgotten space where additional shelving can be installed to discretely store cleaning supplies, toilet paper, towels and the like. 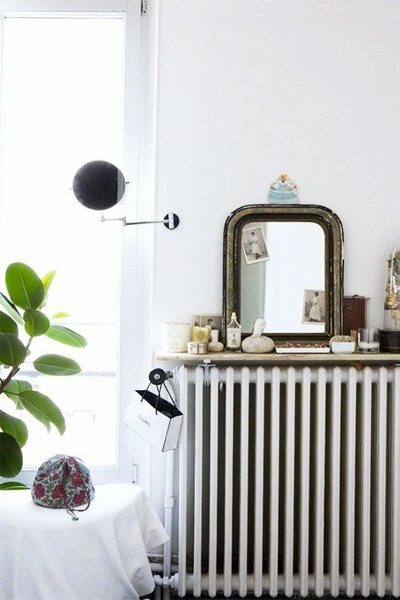 Baskets are a surprisingly chic, affordable and simple way to hide items around the house. Opt to store things you need quick access to, small items or even clutter. Baskets with lids will help make sure you don’t go overboard making a mess. Whether or not they’re pumping out heat, you can use the space above your radiators as shelves—a top tip in the bathroom where couples often quarrel over limited space. Simply measure the area above the radiator and have your local hardware store cut a sheet of wood to suit. Use the thickest wood you can to avoid warping, or if you can get your hands on it, use a piece of marble for a more upscale look. Avoid particle board or anything with a cheap veneer finish, as it will peel. If you answered “no” to any of those, you should get rid of the item. A similar evaluation should be applied to beauty products, tools, magazines… and all those hobbies that never quite panned out. If you don’t see yourself using something, then away it goes. Any redundant items owned by you and your partner should also be donated or sold—e.g. two blenders are not necessary. ﻿Karin Socci: KonMari is a lifestyle method or organizing that asks you to evaluate the things you have in your home on the basis of whether you find them to be especially useful or especially beautiful/meaningful. Those are the things that we say Spark Joy! Things are divided into five categories (clothing, books, papers, miscellaneous, and sentimental) and sorted by category instead of location (bedroom, kitchen etc.) so that you get a full sense of what you have. Once items have been sorted, they are organized so that they are easy to see, easy to get to, and easy to put away. Most people find that by doing this method from top to bottom, things stay organized for the most part. Once your things are organized, the idea is that day to day life is a little calmer and a little more relaxed. ﻿How does one become a certified KonMari consultant? KS: There’s a process that includes demonstrating that you have KonMari’ed your home, attending an intensive seminar, submitting reports on at least 10 practice clients and then passing an exam. All along the way, KMI is providing feedback and suggestions. Have you actually met Maria Kondo? KS: Yes! I have met Marie several times! Not only at the seminars, but I have been involved in media events with her. She’s just like the series shows her: very serene and a little shy, but very open and compassionate. What are some of the specific challenges that New Yorkers face when it comes to organizing their homes? KS: Great question! Space is obviously the main thing. Every square inch of an NYC apartment is super valuable. You are paying a lot for it in rent, mortgage, maintenance, insurance, heating, cooling, and so on. So, it’s even more important that you are certain that each item has “earned” its space by being beautiful, useful or meaningful. Do you really want to devote a foot of counter top to the waffle maker you use once a year? 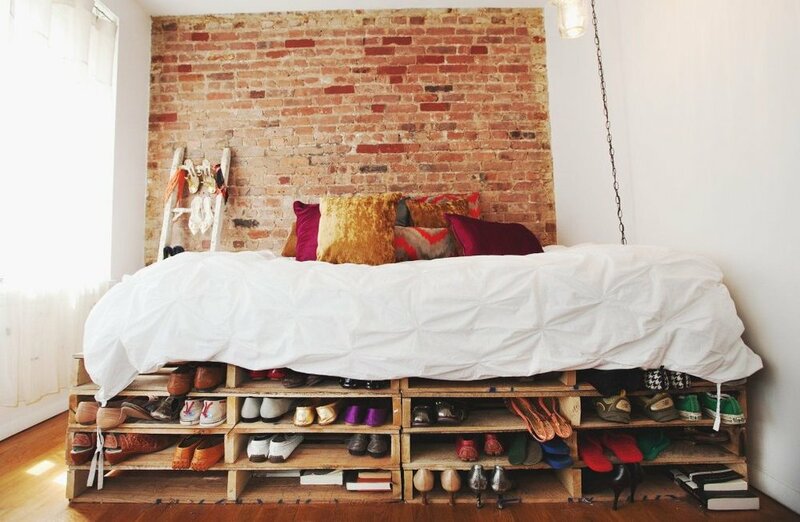 If you love shoes, how much space are you okay with devoting to them? Those are questions that people with suburban homes don’t have to answer as brutally. I have clients all the time who say, “I love all these things, but I will narrow it down because I also want to be able to function in my apartment.” All space used for storage cannot be used for activities. Hypothetically, let’s say a client comes to you for help—a family of four living in a converted one bedroom in Manhattan—about 750 square feet for four people including two children. If they are going to invest in three or four storage solutions, which ones would you recommend? KS: In KonMari, this is a question that can only be answered once things are sorted. We avoid deciding about organizational items until we know exactly what is needed in the space for day to day activities. The first thing I say when people ask me this is beware the big container stores! Bed Bath & Beyond and the Container Store are Disneylands for cramped quarters. They have a very tempting solution for every problem, but shoving unneeded things into pretty bins is not the solution. Now, having said that, there is a place for good storage equipment, and in this case, I would advise the family to have a dedicated basket or bin for each person. This should become the go-to drop off for bags, books, papers that will be leaving the house in the morning as each person starts their day. These can be stacking or not, but each basket should be a respected space. Each person should sort their basket each week to remove things no longer needed. This will prevent some morning chaos. Also, think vertically! Use every foot of space up high. Put up shelves and use high spaces for things not needed as often and then invest in folding footstools. Use all space easily reachable for things needed most often. This is your prime real estate and only things that are needed most often should be within reach. Finally, use boxes or little bins inside of drawers to separate items. I see underwear, socks, and tee shirts jumbled up in the same drawer so often. Not only is it hard to find things, but it’s not a very pleasant sight when you are getting ready for the day. Are there any benefits to living in a smaller but more orderly home? Are New Yorkers actually gaining something by being forced to live in smaller spaces, even with children? KS: I think everyone would answer this question differently, but in KonMari, we always return to the vision of striving to live your ideal life. Do the benefits of living in NYC outweigh the possible benefits of begin able to own more stuff? If you honestly ask yourself how many things you really need or use each day, you would probably acknowledge that most of the things you own fall into the category of “maybe someday I will need this” or “I need this only once in a great while”. So, I think that the decision about whether living in NYC is an overall benefit depends on whether you are living the life you want to live here or not. I work with lots of families who live in very large homes outside of the city, and they also find themselves swimming in stuff and feeling cramped. Space is a vacuum and easy to fill. But there is enormous satisfaction in the feeling that you are sharing your home with just the right number of things. How and when did you start your business and what services do you offer? KS: The Serene Home opened in 2016 after I found my calling. I started my professional life in psychotherapy and healthcare finance but wanted to get out from behind a desk and work with people in a more personal way. I discovered KonMari, went through the certification process and began working with people and families throughout the NYC area. My services are primarily in the home, hands-on, KonMari organizing, although I also provide practical interior design. I do offer virtual organizing for some clients, especially if they are far away, and I also teach classes in Westchester each season and do presentations and workshops. The images on display, chosen from the Schomburg Center’s Photographs and Prints Division, show a side King in his life, in travel, at rest and in celebration–a contrast to most popular iconic photography of the leader in his leadership role. The show’s title was taken from 1959 biography of King, “Crusader Without Violence,” published by Dr. L.D. Reddick. Reddick was curator of the Schomburg Center collection after Arturo Schomburg and a friend of Reverend King’s. The exhibit will be displayed through April 6 in the Schomburg Center’s Latimer/Edison Gallery at 515 Malcolm X Boulevard.